July 20th, 1969 was the day that people from Earth set foot on different soil for the first time. Here we are 48 years later, and the world’s space programs are — well — not very close to returning to the moon. If you aren’t old enough to remember, it was really amazing. The world was in a lot of turmoil in the 1960s (and still is, of course) but everyone stopped to look at the sky and listen to the sound of [Neil Armstrong] taking that first step. It was shocking in a good way and almost universally observed. Practically everyone in the world was focused on that one event. You can see some of that in the NASA video, below. Space flight was an incredible accomplishment, but it paled in comparison with the push to actually landing a person on the moon and bringing them home safely. The effort is a credit to the ability of people to work together (on the order of thousands of minds) to overcome a difficult challenge. We can learn a lot from that alone, and it makes a compelling argument to continue taking on tough problems. Today, as we remember the Apollo landings, let’s take a moment to recognize what came of it beyond an iconic boot-print in the floury lunar soil. If you did miss it, you can relive a lot of the landing at a really interesting site called First Men on the Moon. It isn’t a new site, but it has audio from both the ground and the spacecraft synchronized with a transcript, some graphics, video, and telemetry. Watch [Aldrin’s] heart rate when the guidance computer goes wonky (starts about 102:42). Some of the voices on the ground sound a little uptight, too. Seriously, this is one of the most amazing sites ever so if you haven’t seen it, check it out. NASA also has some interesting 3D imaging of the historic landing site, courtesy of more modern gear now orbiting the moon. In 1960 there had never been a person in space, and barely even any man-made equipment (Sputnik launched in 1957). In 1969, some guy is stepping out on the moon. That was an amazing timeline and it made the 1968 movie 2001: A Space Oddessy seem like it was overly pessimistic about what human spaceflight would look like in 33 years. Very few people thought the space program would stall out. Sure, we had the Space Shuttle, but it barely made orbit and certainly couldn’t go to the moon, Hollywood movies notwithstanding. We’ve had a few space stations both international and from specific countries. 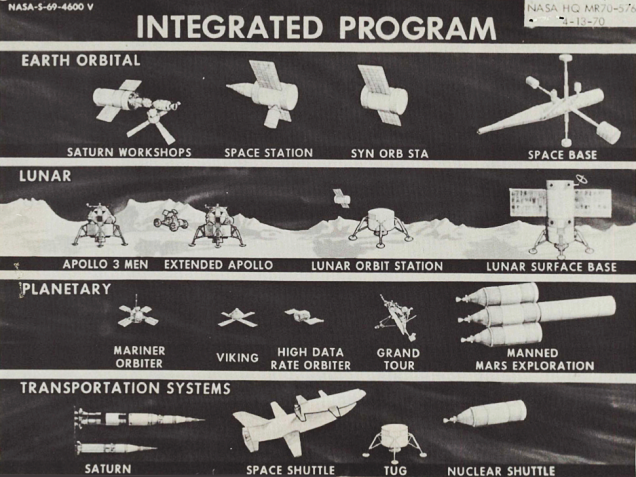 However, since the end of Apollo, there hasn’t been a lot of inspiring manned missions. Even the shuttle was a pared down version of an entire fleet of vehicles that NASA wanted. Most people who read a site like Hackaday are interested in manned spaceflight. You might not agree how one particular country or another is going about it, but I’m willing to bet the majority see the value of having humans in space. If you haven’t noticed, though, we aren’t the majority. A lot of people don’t know why we spend money in space. In addition, in the United States, polls consistently show that people think NASA has a giant chunk of the Federal budget when, in fact, it runs about 0.5% of the total up to around 1%. A 1997 poll found that on average people estimate NASA’s budget at 20% of federal expenditures. Even at the height of the space race, it was well under 5%. It’s a paradox of promoting what is a very amazing engineering program which can be appreciated by the layman, while putting the program in the crosshairs for budget cuts since people assume if it’s a household word it must cost a bundle. There are a lot of good arguments for space. A lot of spinoff technology either came from manned spaceflight programs or were enhanced or accelerated because of the different manned programs worldwide. You can argue that we need to learn to live off the planet so we can spread out and have some resilience against an asteroid strike or screwing up the ecology permanently. We are a long way from where we could self-sustain on another planet, but you have to start somewhere and the ancillary discoveries in material science and other technologies are well worth the work. But those are not the best reasons, in my mind. The best reasons are the human reasons. A whole generation of engineers and scientists got interested in those subjects because we watched humanity reaching for the moon. Sure, the media made heroes out of the astronauts and cosmonauts. But we kind of knew that those men and women were supported by a legion of technical experts and innovators and — in the case of some high-profile mishaps like Apollo 13, and a Skylab incident — hackers. We wanted to be in that legion. Well… most of us wanted to be astronauts, but reality sets in pretty early if you aren’t winning the rope climb in PE class. Some of us did go on to work on space-related projects. But a lot of us just became engineers and scientists and had productive careers somewhere else. That’s the best reason, as far as I’m concerned. I can’t think of any one or anything that inspires young people today in quite the same way. You’d think that would be worth less than a penny per dollar in the Federal budget. The other human reason is creating those focal points for humanity. In an age where far too often the world’s attention is only brought into a focus by a terror attack or a natural disaster, we need to see uplifting efforts to create rather than destroy. We need to bring the world’s attention to acts that are constructive and wondrous. In the United States, manned spaceflight is going commercial, with several companies building manned vehicles to carry people to the International Space Station. That’s still not going to get us to the moon and beyond. There are plans to go to Mars, although they seemed to be stalled. The only country making big strides in manned spaceflight these days seems to be China and we applaud them for prioritizing the effort. In 1969, no one could imagine what the reality of 2001 would be. We can’t imagine what it is going to be like in another 40 or 50 years as far as space travel goes. But one thing is certain. It will be a very long time before the events of July 20, 1969 are forgotten. It was truly one of the great moments in human history. The moment has passed, but many of the people who made it possible are still here. If you are interested in the computers that let Apollo land on the moon, you really should read this explanation of the software from someone who helped write it. And if you can connect us with anyone else who has a story to tell about that age, we want to hear from you! I just finished reading “The Wright Brothers.” Now there were a couple of guys that changed the world (relevant because they were great hackers). I don’t see the the moon landing changed much other than to give Americans bragging rights. Well, as I said above, I disagree. That inspired a generation of us to learn and build. Turns out, though, that manned space has brought a lot of benefit to the private sector, but in my mind it all pales compared to the value of providing that draw to what we would today call STEM. My high school electronics teacher worked for NASA. His main job was working with data recorders (telemetry). He brought in a printout of the Apollo 11 countdown printed on the ancient tractor-fed green-white printer paper with the steps performed highlighted in color pencil. He was a major reason I went into engineering after a stint in the USAF (went to Lackland with his son). My original goal was to work for NASA. Never did, but did work on small projects for them as a supplier..
How I long for those days…now we have “alternative facts”, anti-vaxxers, flat earth loonies and “Breathairians”. True about Velcro — I couldn’t find the reference…and the inventor died before it really caught on. Sad. Even better, one can convincinly argue that some of that, maybe even all of it, was already there at the time when the moon flights took place, and NASA was simply utilizing existing technology to get there fast enough. That’s after all what NASA was: they didn’t make stuff on their own – not really – they went around the industry asking “Do you have this? Do you have that?” and the industry would re-purpose stuff they already had sitting on the shelf – like gas pipeline turbo pumps into rocket engines, integrated circuits into computer modules etc. etc. The greates contribution that NASA had was to show what could be done with the stuff – it was like a great advertising agency for technology at a time when people were still stuck in a horse and buggy mindset. I politely but very STRONGLY disagree. It kickstarted a lot of technological progress but most of all it inspired a generation to reach for the stars and do the impossible. Depends on the person as to what the impossible is. Surviving a childhood trauma where being kidnapped along ones own siblings from the father by a dike who hates anything male. Surviving a lack of grades caused by said dike changing ones’ geolocation to disrupt education and downgrade schooling. aiming to revive said grades by spending clothing allowance to contribute towards higher education allowance for A BTEC L1. Aiming for the better of two situations and dropping out of BTEC L2 despite mostly distinction grades to aim at not being homeless. In my case it was aim for the stars and land on the sea… at least it wasn’t in the sea drowning. However being just floating… things could go either way. One day I’ll be out of the rut I’m in. I’ll keep trying for those stars.. Will never know where things could go. You are much more interesting than this article. This sounds like it would be quite the coming of age book. Rambling mental cases interest you? Go find a job at a mental facility, they always need people because for some reason there are a lot of dropouts. “The Bishop’s Boys” is a great read as well. Going by the Merriam Webster definition of Hacking; a person who is inexperienced or unskilled at a particular activity. The Wright Brothers were not hackers. They were very skilled self taught engineers that utilized the Scientific Method to accomplish a specific goal. There is a big difference between an Engineer who has put in the time to learn the principles and skills and someone copying a project from the web or designing something without considering all the factors involved. To understand this, one should read the stories of the pioneers of flight that failed. Wishful thinking comprised part of their design process. They were the hackers. Hacker has now been romanticized to now have a meaning not even close to the original intent. I can basically work with this new definition up to the point of calling the Wright Brothers hackers. One should not deal with design factors the same way that some deal with the meaning of words or you will be back to emotional wishful thinking as part of your design process. I was 13 and obviously watching all it on TV. Happy to watch it again. Too much to read in the short break time… Will read some more later. Hopefully there won’t be any of those religious level flat Earthers trying to say the mission and landings are fake in order to satisfy their word for word literal take of their books’ text. Yep, the world is round (Spherical/pear-ish shape) and humans have visited the moon. Told you it was fake! What if the front falls off? I have not done much study in the Christian bible but I am unfamiliar anywhere in the Hebrew/Jewish scriptures there is any mention of flat earth, at best there is mention of four directions and a heaven above and earth below. Read in its original Hebrew with a bit of Aramaic it would probably avoid mistranslations into Latin, Greek, English etc by translators who might have never spoken to anyone who understood Hebrew, this is certainly the case with the King James bible from a time where Jews were Illegal in England and who had no concept of cosmology except a pancake earth. Are there really any true flat earthers or Apollo-deniers; I have always assumed they were some bent hipster bunch having fun trolling people. Funny that almost all the flat earth/space conspiracy YouTube videos I have seen were made by Americans. I have no problem with that, they paid for the moon landings so they can complain if they want to. What surprises me is that these rubbish arguments are spouted straight faced without a hint of humour by people who have accumulated years of schooling in what, by overall world standards, are well funded schools. Come on guys, get real, because the great benefit to humanity of the space program(s) is that they have demonstrated the hard, physical reality of what is out there. On a clear night you can see almost forever, and it’s all real. You wouldn’t come across some Hungarian flat earther on youtube, because the search terms would need to be in Hungarian and not English. You exist in an anglophone bubble. Apparently “The round of the earth” means the earth is disc shaped…. LOLOLOLOL. Then there is the middle-ages flat-earth cults that either modified the bible (If I remember correctly, also as you mentioned: King-James era also) or just completely Jordan Maxwell-ed it to hell before Jordan Maxwell made it cool to twist words in impossible ways as so the sun means son therefore Jesus is the sun god of some Egyptian religion before his birth and long before the English language even existed…. somehow. Only Jordan Maxwell can make such crap up! Did you mean the Jewish or the King James era people being the “pancake-Earthers”? I currently presume you mean the English (King James era people) are the pancake-Earthers. I was meaning as late as the era of King James England. Apparently the Jewish scholar Rambam of about 900 years ago supported the ideas of evolution and a 15G-year old universe. Fun reading in the modern era. It is a matter of perspective. Every peasant in the Middle Ages could look to the horizon and see that Earth is indeed flat. It was also quite obvious to him that Earth is still and the Sun and the Moon are moving accross the sky. Only when we moved away into space and changed our perspective, we could really prove that Earth is a sphere. The spheroid nature of earth was known since BC times. Eratosthenes of Cyrene is the first recorded instance of someone proving this but he wouldn’t have tried to calculate the diameter of the earth (and succeeded to a couple % accuracy) if it weren’t at least a common idea in academia. Very true. But.. how big was academia at the time and how much influence did it have on the general population? people didn’t think earth was flat in the middle ages, that is itself a misconception. Pretty sure the first hot air balloons would show that earth was round as you could see beyond 23 miles. I have a friend that believe the moon landing hoaxes (and a few other things) and have tried several times to “convince me of the truth”. I have even seen two of the suggested documentaries (and as expected they are utterly stupid), just to completely take them apart, including with “their own evidence” and experiments at home to disprove the claims and using his own experiences. But it just wont work. And thats a person who comes to me with anything technical or historical questions, or for me to fix things. Its quite sad really, but has made me learn something about indoctrination and cults. My brother was the same to an extent… always going to the more technical of people fro help and advice on technical things… It took convincing him to watch the debunking-of videos to finally get him to open his mind to other things…. he is still fairly closed minded… however he is now learning ahead of me for computing technical thinking and use…. by not much and only in some areas. I have a “Christmas” card sent to Author Strickland from his Soviet counterpart. The envelope has a sputnik postage stamp, which I found a bit amusing. There is even an QST article where a ham was reported to have picked up conversations while the astronauts were on the lunar surface. Not unrealistic if you consider Ham’s use EME (moonbounce) communications. AFAIK in the bible the (night)sky is describes as a dome with little holes in it, and the earth as being universally flat with unknown limits. It’s as if religious people have always been a bit daft. An interesting thought from Charles Adler’s excellent book on the physics of SciFi and Fantasy concepts: Why has manned space exploration stalled? Because mankind has created small powerful computers! Thinking this one step further: we are in the transition between “need to send human” to “humans? what was that again?”. Careful so you don’t fall into the optimist’s bias. Just because things were going up doesn’t mean they will keep going up, at least at the same pace. 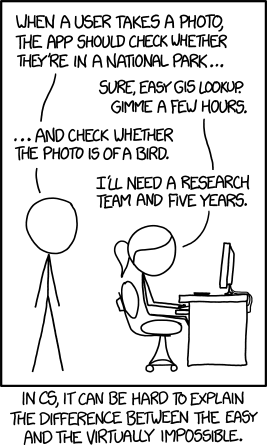 there are AI’s capable of beating humans in image recognition, the project was published in 2015.
the TLDR version is that they are marginally better at general image recognition, ie is it a bird or a plane or a poster, but almost twice as good at detail analysis and extraction, what species of bird is it or is it a bird or a model. not saying it wasn’t a challenge but it seems like we have a workable solution. I was 5 when the moon landing happened, so I don’t have any real memories of the event, but I was really inspired by the space program throughout my youth in the 70s. I remember being glued to the TV as the Viking space craft beamed the first picture from the martian surface, line by line. Maybe that is why I’ve never been a real proponent of the manned part of NASA (I could never win the rope climb). Like on Earth, there are many jobs machines can do better than men, and space exploration is one of them. We really should wait on the manned part of space travel until there is something that only humans can do on a new planet, like having babies to reduce the risk of extinction because of our single point of failure planet. The write up is pretty clear on the purpose of human space exploration: it is more inspiring (it makes the science real to the average Joe in a way that rovers and probes do not) and it gives humanity a common goal. The transfer of technology developed for space missions to the public sector is the real prize here. There is merit in focusing on only mechanized travel, but I gotta believe that the inventions geared toward dealing with the necessities of humans will be significant. The average Joe lost interest in space as soon as “his team” won the space race. The write up is pretty clear that he would now like to eliminate NASA now. It’s time for the grown-ups to have conversations about the best way to use the limited funds for space research, and let the latest fad in reality programming inspire the average Joe. You mean like inspire the general population to stop being superstitious ignoramuses and start working together to develop the science and technologies that will make all our futures better? Ok, got it. Let’s get people up there now! You know there aren’t actually any boot prints on the moon? Solar wind, though insignificant in many respects, over time is bound to have an effect. Plus the bi-annual transits through meteor belts (leonid and perseids) plus the many tons of flotsam that accumulate daily are bound to erode features at a predictable rate. Even accounting for tidal lock the moon has to sweep up literal tons of debris on the earth face. Then there’s the 16 kN from the ascent engine to destroy any foot prints near the LM. Buzz Aldrin reported the Apollo 11 flag being knocked down by the ascent engine exhaust. The other Apollo flags, however, are still standing: https://www.space.com/16798-american-flags-moon-apollo-photos.html. That’s because they literally have all the money in the world. No, they don’t have all the money. It’s a matter of priorities. The US probably wastes more money on military boondoggles than the Chinese spent on their space program. The Chinese have one thing in their favor – a long term strategy. The only thing that interests the US (and many other countries) is winning the next election. Or going to war with the neighbors. That is easy when you are run by a central committee that answers to nobody. On the other hand, there is a plus to have long-term plans. Who has long term plans? I was 13 when Apollo 11 landed. It was a huge deal. I was a big space fan as a kid and was fortunate enough to work on a couple of NASA spacecraft in the 1970’s. I remember watching the first Mercury launches when I was 6 years old. Kids that age all wanted to grow up to be police officers or firefighters. After that they all wanted to be astronauts. Not me. I wanted to be the guy in the control room pushing the launch button. I guess that was an early indication I was meant to be an engineer. If you want to read a good book about the Apollo flight computers, check out Digital Apollo by David Mindell. It is amazing how they did it. Today you can buy an ARM processor with more capability for about $1. It is sad to think of where we could have been with even a little more leadership and courage. I hope Musk, Bezos and others trying commercialize space succeed where governments have failed. The thought of *uncontrolled* people in space scares the piss out of them, so they’ve worked for decades to stop putting people into space, starting with cutting NASA’s budget before the Apollo program started. Ending the Moon landings early wasn’t due to lack of interest by the public or running out of interesting things to do on the Moon. It was planned by politicians who never wanted Americans on the Moon in the first place. Media and films are produced by those who meet the leader(s) who run the same country of film-makers’ residency and they meet up in usually private funny-handshake clubs. It wouldn’t be much of a surprise if the idea for such films arrived from a conversation with such a form of leader (Direct leadership or indirect). Possible… but no direct-from-the-horses-mouth or obvious evidence as such, so only some speculation on such possibility. it’s only a theory if you have a way to test it. Otherwise it’s a hypothesis at best. I’m a big fan of the unmanned program. Hubble, Web, COBE, IMAP, et. Along with CERN, among humanities outstanding achievements. Smoking and selling hopium ultimately results in discouragement, disillusionment and despair. You do youth no favors with optimism and unrealistic visions and expectations. If all the money blown on manned spaceflight, the ISS, was spent on propulsion research, perhaps we’d have bases on the moon, mars and manned planetary exploration. Our ancestors didn’t colonize distant lands on log rafts. They built ships and developed the technology. Be serous. Be for real. Then maybe we will make it to distant stars. The Russians already had people in orbital space stations not unlike the ISS for decades. Did they not learn what lessons could be learned form such a thing? I thought that when the ISS was built they were supposed to kick into high gear studying things needed for long duration flights and permanent colonies. It seemed like for the first decade and a half or so though all they did was materials research for private companies. Along the way we have learned that prolonged zero-g is bad for you. Oh well, weren’t all those imagined future space ships supposed to spin and provide about 1G anyway? And, what happens under lunar or martian gravity? Is anything less than earth eventually deadly? Or do all the bad things happen at some amount of gravity less than earth’s but greater than zero? Or maybe it’s a linear progression? Perhaps with a space station designed for learning these things (one that spins) we could know! Radiation shielding? Kind of hard to test when you are still under Earth’s protective magnetosphere. Well.. at least we finally have a recycling space toilette and are finally starting to grow a few vegetables. At this rate maybe when the apes replace us they can inherit enough information to start a real space program. you do realize that most of your complaints are exactly what they did right? the russian lifesupport system, even for mir, was close to non existant, we have submarines with better life support these days. Then how did the cosmonauts survive there so long? No. They just went at a time the sun wasn’t very active and hoped to get back before the next solar storm. Fortunately solar activity peaks and wanes in a predictable cycle. It was possible that a freak, off-cycle storm could have fried them at any time though. What if… This whole “reality” is actually a simulation and we’re already floating in space towards our destination. What if… religion came out of a glitch in the matrix of this space craft as a confusion resulting in a conscious carry-over in the simulated rebirth to stop us going mad. What if… we’re at the end of our journey and the Nuclear war threat was a warning the craft is barely making it to the other side and needs to simulate an excuse to lower craft population to ensure survival….. Religion stop us from going mad? The rest of your post seems relatively sane compared to that one! The Religion noun is the unintended consequence of the happening of the above phrase. Though… “Religion to stop us going mad” is counterproductive LOL. Damn Matrix always glitching. Wonderful article on the spirit guiding the early days of spaceflight. Very similar to the story we’re looking to tell in our upcoming film: “When We Were Apollo.” Will definitely be sharing!